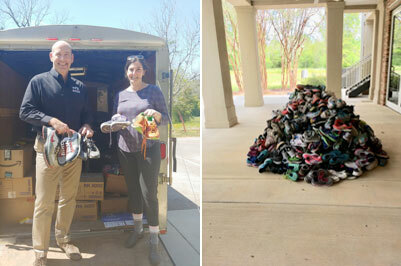 Daphne, AL (April 4, 2019) –Local runners and exercise enthusiasts may have put a lot of miles on old running shoes, but when they are donated to the “Many More Miles” campaign, those shoes will come to life again as they land on the feet of someone who really needs them. For the 16th consecutive year, Baldwin Bone & Joint, P.C. once again hosted an important community project, “Many More Miles”. Partnering with the local schools, the Port City Pacers, Dr. Glenn Glass and the University of South Alabama Student Recreation Center to collect shoes for the homeless outreach programs of Family Promise of Baldwin County and Wings of Life. Shoe donations for 2019 were accepted January – March 2019. This year’s campaign was record-breaking with 2,728 pairs of shoes donated! Local students were the overall greatest contributors to this year’s campaign – donating 1909 pairs of shoes for this special homeless outreach project, hosted by Baldwin Bone & Joint. The top three schools (Fairhope Intermediate, Rockwell Elementary and Mary B. Austin) were awarded cash prizes to go to their P.E. programs. Other schools participating in this year’s campaign include: Dixon Elementary (MC), Bayside Academy (BC), and Spanish Fort Elementary (BC). The schools collectively contributed 70% of shoes donated! Thank you to all!